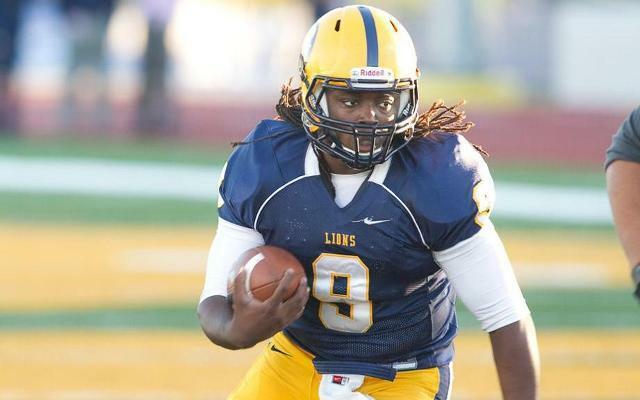 Deric Davis tied an A&M-Commerce program record with five touchdowns in the 65-43 victory over McMurry. Billed as an offensive showcase, A&M-Commerce and McMurry didn't disappoint as the two teams combined for 108 points and nearly 1,100 yards of total offense as the Lions won the shootout 65-43 over the War Hawks. A&M-Commerce improves to 5-2 on the season while McMurry drops to 1-6. Junior quarterback Deric Davis had a night for the record books as he scrambled for five touchdowns in the victory, tying the A&M-Commerce program record for most touchdowns in a single game. He shares the mark with Marvin Brown (vs. Sam Houston State in 1952) and Donald Lee (vs. Eastern New Mexico in 1985), etching his name into the A&M-Commerce record books. A&M-Commerce racked up 510 yards of total offense on the night as junior quarterback Harrison Stewart was impressive in his first start as a Lion, completing 27 of his 39 passes for 372 yards, two touchdowns and an interception. Two Lion receivers eclipsed the 100-yard mark on the night, led by junior Vernon Johnson's 147 yards on six catches, including a 22-yard touchdown pass in the first quarter. Junior Seth Smith set a new career-high in both receptions and yards, leading the Lion receivers with 10 catches for 115 yards on the night and a touchdown. A&M-Commerce's rushing attack also showed some signs of life as freshman Ki-Janaven Garrett rushed for 142 yards on 17 carries, becoming the first A&M-Commerce 100-yard rusher since Marcus Graham ran for 152 yards against Eastern New Mexico in 2011. True freshman Richard Cooper also scrambled for 31 yards on eight carries. Johnson was also lethal on kick returns, returning four kicks for 201 yards on the night, including 76 and 80-yard scampers, to give him 348 yards of total offense on the night. Defensively, A&M-Commerce struggled against the McMurry offensive attack, giving up 552 yards of total offense, including 412 yards through the air. But the defense came up in key situations as junior Charles Tuaau recorded 2.5 sacks on the night while senior Tevin Moore added 1.5 sacks and 2.0 tackles for loss as part of his eight stops. Junior Davarus Shores racked up nine tackles on the night, including five solo, while junior Ronald Fields posted eight stops. Freshman Cameron Rogers was a thorn in the War Hawk side all nigh with five total tackles and a pair of interceptions with juniors Corey Childs and Tyree Barton also notching interceptions for A&M-Commerce. The first quarter set the tone for what would be a hard game to describe as A&M-Commerce and McMurry combined for 52 points and 378 yards of total offense, kickstarted by a 76-yard kickoff return for Johnson. Davis would punch it in from one yard out to put A&M-Commerce on top 7-0. McMurry would answer with a nine-play, 67-yard drive to tie the game at seven, only to see A&M-Commerce strike back with a four-play, 75-yard drive of its own. The drive was highlighted by a 45-yard pass from Stewart to Johnson and capped by a four-yard touchdown scamper by Smith as the Lions reclaimed the lead. A&M-Commerce extended the lead to 21-7 as Stewart and Johnson connected on a 22-yard touchdown strike two minutes later, which was quickly answered by the War Hawks as quarterback Gabe Rodriguez hit Greg Livingston for a 10-yard pass completion, followed by an 80-yard dash to the endzone to cut the deficit to 21-14 with 5:33 remaining. But neither of the two teams were done as Johnson returned the ensuing kickoff back 80 yards to the McMurry one yard line, followed by a one-yard touchdown plunge by Davis on the next play to extend the Lion lead back to two scores at 28-14. A&M-Commerce's defense then struck for the first time as Barton intercepted a Rodriguez pass and returned it 21-yards for what looked like another Lion touchdown. But an unsportsmanlike celebration on Barton at the two-yard line nullified the score and put the ball back on the McMurry 17-yard line where the Lions would have to settle for a 37-yard field goal from Saul Martinez, giving A&M-Commerce the 31-14 lead. McMurry's offensive firepower wasn't about to quit this early in the game, however, as the War Hawks put together an eight-play, 58-yard drive to find the endzone once again, bringing the wild first quarter to a close at 31-21 A&M-Commerce. Both teams settled down in the second as the only points consisted of a 26-yard field goal from Martinez and a touchdown strike from McMurry to cut the A&M-Commerce lead to 34-28 heading into halftime. McMurry would take its first lead of the game early in the third quarter as a sack of Stewart resulted in a fumble that the War Hawks returned down to the one-yard line, and would punch into the endzone on the next play to tie the game at 34-34. The ensuing extra point would add another bizarre twist to a wild game as the Lions blocked the attempt, sending the ball fluttering in the air. After a skirmish in the endzone, McMurry recovered the loose ball for a two-point conversion to take the lead 36-34. Martinez would connect on another attempt, this one from 27-yards out, to reclaim the lead for the Lions at 37-36. But the War Hawks would once again go out in front with a 19-yard touchdown strike off an A&M-Commerce fumble late in the third quarter, taking a 43-37 edge into the fourth. With the game on the line, A&M-Commerce stepped up in a major way in the final 15 minutes of play, putting four touchdowns on the board and outgaining McMurry 159 to 13 to seal the game. The Lions drove deep into War Hawk territory on three-straight possessions, each of which was capped by a touchdown run by Davis as the Lions raced back in front 58-43 with 5:50 remaining in the game. A&M-Commerce's defense then sealed the victory as Childs intercepted a War Hawk pass and raced 19 yards to the endzone with 1:29 remaining, giving the Lions their third-straight victory. It marks the first time A&M-Commerce has scored 65 points in a game since a 65-21 victory over Sam Houston State in 1979. The 65 points is tied for the second-most in program history, a feat the Lions have achieved two times previous, behind the program-record 80 points in a win over Northwestern Oklahoma State in 1953. The Lions improve to 10-5 all-time against McMurry as the two teams met for the first time since the 1971 season. A&M-Commerce is 7-1 against the War Hawks in Commerce as the Lions are just one victory away from guaranteeing themselves their first winning season since 2001 when A&M-Commerce went 7-4. If the Lions are going to achieve that feat this coming week, it will take a big effort all the way around as A&M-Commerce travels to 15th-ranked and LSC-leading Tarleton State on Saturday, October 26th. The Texans are coming off a 38-36 loss at Delta State Saturday night as the two teams will battle in the fourth installment of the President's Trophy. Kickoff is set for 7 p.m. from Stephenville.